Studying the many ideas about how giving charity atones for sin and other rewards in late antique rabbinic literature, this volume contains many, varied, and even conflicting ideas, as the multiplicity must be recognized and allowed expression. Topics include the significance of the rabbis’ use of the biblical word "tzedaqah" as charity, the coexistence of the idea that God is the ultimate recipient of tzedaqah along with rabbinic ambivalence about that idea, redemptive almsgiving, and the reward for charity of retention or increase in wealth. Rabbinic literature’s preference for "teshuvah" (repentance) over tzedeqah to atone for sin is also closely examined. Throughout, close attention is paid to chronological differences in these ideas, and to differences between the rabbinic compilations of the land of Israel and the Babylonian Talmud. The book extensively analyses the various ways the Babylonian Talmud especially tends to put limits on the divine element in charity while privileging its human, this-worldly dimensions. This tendency also characterizes the Babylonian Talmud’s treatment of other topics and briefly surveys some post-Talmudic developments. 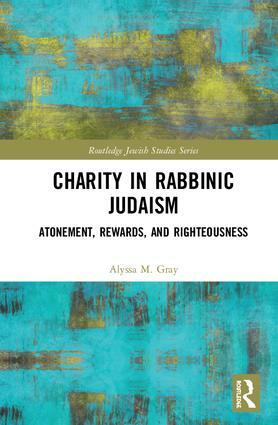 As the study fills a gap in existing scholarship on charity and the rabbis, it is an invaluable resource for scholars and clergy interested in charity within comparative religion, history and religion. Alyssa M. Gray is the Emily S. and Rabbi Bernard H. Mehlman Chair in Rabbinics and Professor of Codes and Responsa Literature at HUC-JIR in New York. She is the author of A Talmud in Exile: The Influence of Yerushalmi Avodah Zarah on the Formation of Bavli Avodah Zarah (2005) and numerous shorter studies on wealth, poverty, and charity in rabbinic literature and on the formation of the Babylonian Talmud. Studies, which are interpreted to cover the disciplines of history, sociology, anthropology, culture, politics, philosophy, theology, religion, as they relate to Jewish affairs. The remit includes texts which have as their primary focus issues, ideas, personalities and events of relevance to Jews, Jewish life and the concepts which have characterised Jewish culture both in the past and today. The series is interested in receiving appropriate scripts or proposals.